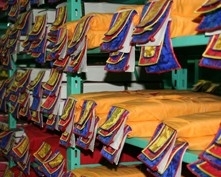 Columbia University holds several editions of the Tibetan canon, in print and electronic formats, including the Narthang, Dege, Lhasa Shol, Urga, Peking manuscript, and Gyantse Tempangma editions, etc. This page was developed with assistance from CU graduate student Runxiao Zhu. It provides links to several online finding tools for the study of Tibetan Buddhist canonical texts, as well as information on the editions available at Columbia University. This list surveys the canonical editions available at Columbia University. For more information, please consult "Introductions and Finding Tools" (left sidebar), as well as the genre heading "Canon" in the Tibetan Buddhist Resource Center online database.